アイス (frozen treats) you will find in Japan. It ranges from about 60 yen (60 cents) to 120 yen ($1.20) a bar. It took off in the 1980s and has been on the top sellers for years. Japan loves to experiment with flavors and GariGari Kun certainly seems to enjoy exploring the flavor palette. 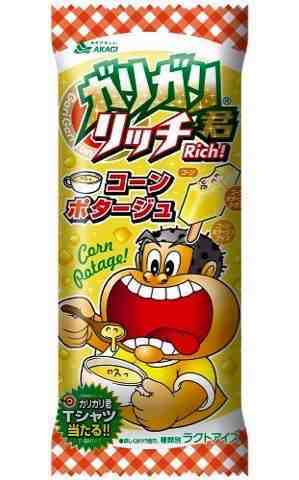 It's Corn Potage soup flavored Popsicle has frozen corn kernels in it as well. Surprisingly the Popsicles melts in your mouth quickly which thaws the corn chunks. I found it quite tasty at first but near the end the novelty wore off. Would I buy it again? Probably not... I think I'll stick to their standard soda flavored one. 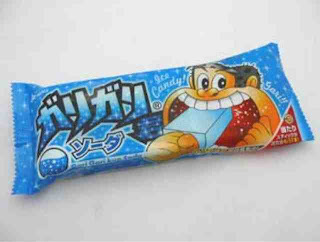 Just in case you are curious about the name GariGari, it is a play on words in Japanese. 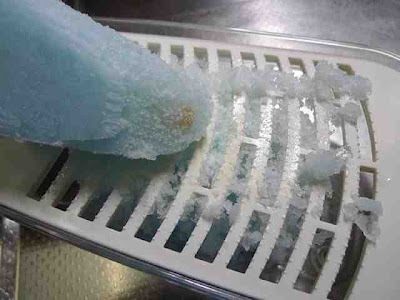 GariGari is the sound made when chewing something grainy like shaved ice which is actually in the center of the Popsicle. This is just one example of the Japanese sales approach to create a buzz by taking something that is famous and beloved by the public and repackaging it or adding a new flavor. It is quite successful I think, it worked on me.